To inform breeders of the need to keep up and increase the traditional Irish horse herd, we the T I H A are conducting a roadshow commencing at 7.30pm on Wednesday 27th of February in the Lord Bagenal, Leighlinbridge, Co. Carlow. Speakers include Dr Emmeline Hill, U.C.D. Dr. Hill made a historical breakthrough in establishing a specific gene peculiar only to the T I H population thus identifying the T I H as a breed in its own right. The UCD speaker will be backed up by the one and only Sam Watson. Riding his superhorse Horseware Ardagh Highlight (ISH)(TIH) whereby he won a silver medal for Ireland at the recent World Equestrian Games in America. On Wednesday 6th of March 7.30PM the show rolls on to the Cavan Crystal hotel to hear words of wisdom from the renowned William Micklem. He is both an entertainer and an authority. As a coach, his understanding of horses mannerisms and riders frailty is immortalised in his design of the Micklem bridal. He will be accompanied by Victoria Teuton who has produced and ridden National and Balmoral champions and coached riders. His second accomplice is Simone Hirshin. Simone is a dressage rider and coach. She is riding T I H horses to Grand Prix level. Their contribution will be concluded by Dr. Alan Fahey, Associate Professor from UCD. On Tuesday 12th March 7.30PM the show invades the Ard Ri hotel, Tuam with three eminent lady speakers headed by Alison Corbally, director of breeding in HSI, together with our worldwide coach Sally Corscadden and well-known owner of Kylemore Stud Olive Broderick. They will discuss the successful breeding of elite desirable horses and the necessity for blood and jump in a breeding program. The finale on Thursday 21st March 8.00PM at the Springfort Hall Hotel, Mallow will end with an in-depth discussion on the T I H broodmare herd by the author of the RDS book of "a profile of Ireland's elite T I H mares” Marcus O Donnell. He will be accompanied by Associate Professor Alan Fahy and the well-known producer Philip Scott, discussing preparation of young horses and reminding us of the many recent successes of T I H horses including: Ardcolum Duke, Hallowberry Cruz, November Night, Away Cruising, Alfie's Clover, Park Trader, etc and the success of Mr Chunky by Jumbo and Horseware Ardagh Highlight by Puissance who is an own brother to the sire Imperial Tiger. Success was also experienced by TIHA as 15 mares are currently in foal to Traditional sires and those breeders can look forward to a reward of €300 per live foal delivered. Every August Limerick show hosts the TIHA Festival of Traditional Irish Breeding. These classes have been very successful over the years and TIHA. are pleased to announce the introduction of a yearling filly class and also new for 2019 is the TIH Supreme Champion who will be presented with the Lady Hemphill memorial trophy and a total prize fund of€750.Furthermore producers of TIH horses can look forward to the highly successful Show and Go Sale which will be held on Tuesday 3rd. of September in the Mullingar Equestrian Centre. Further information can be found on the updated TIHA Website www.tiha.ie and Facebook page . Winner of T.I.H.A. Limerick Matron was John Roche with Assagert Mistress 8yr m Bay S.Kings Master.D.Assagert Millinuim. Judges: Mr Michael MacEwan and Mr George Chapman. We are delighted to welcome you to our 5th. T.I.H.A. Hunter Show & Go Sale. It is advised that all horses be on site in Mullingar Equestrian Centre before 9.30am on Tuesday 4th. September. If you wish to travel up the evening before stabling will be provided on request. This can be arranged by contacting Mulllingar Equestrian Centre directly. On arrival, horses must report to the office with (a) Horses Pass Port (b) Veterinary Certificate – without both of these documents horses cannot be included in the sale. Riders are advised to wear full hunting gear & horses must be turned out to a high standard. 4. Once your horse has been selected for the sale, under NO circumstances can he/she be sold prior to the sale, anyone in breach of this ruling will not be accepted in any future T.I.H.A. Sales. It is hoped to have the first horse on the track at 11.am.. Horses will run in strict numerical order for the jumping phase & the auction. No exceptions. ! Every effort will be made to accommodate riders who have multiple rides provided you inform us on the ‘acceptance form’ . Owners must select a Veterinary Surgeon of their choice from the Veterinary Panel provided below. T.I.H.A. & Mullingar Equestrian Centre have put a considerable amount of time & effort in to this initiative and we look forward to your co-operation on the day. On behalf of the Traditional Irish Horse Association & Mullingar Equestrian Centre, we would like to wish you every success on the day and thank you for supporting our sale. 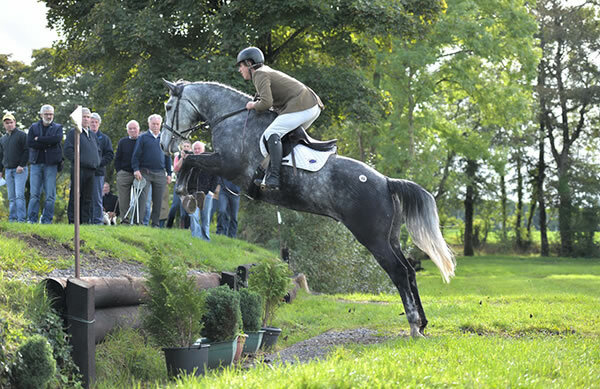 The 5th Hunter Show and Go is taking place at Mullingar Equestrian Centre. Entry forms for selection dates are now available. * If your animal is for sale please indicate on the entry form. Every effort will be made to include this information in the catalogue with all entries received on or before August 17th 2018. Thoroughbred Mares with National Hunt Pedigree, in foal or with a foal at foot by : (a) Approved Irish Sport Horse Stallions provided that such stallions are of Thoroughbred/ I.D. cross (b) Class 1. Connemara Pony Stallions (c) Class 1 , I.D. Stallions or Class 2 I.D. Stallions approved in the I.S.H. Stud Book. For mares with foal at foot, covering details for 2017, signed and dated by the stallion owner, MUST be entered in the mare’s passport and available for inspection on show day. Mares without a foal at foot MUST have a current pregnancy certificate, signed and dated by a Veterinary Surgeon, together with a certificate of covering, signed and dated by the stallion owner available on show day for inspection. ENTRY FEE to Championship €20 - Closing Date August 17h. FOALS MUST BE OUT OF PARTICIPANTS OF THE Limerick Matron Championship. Thoroughbred Stallions, Connemara Stallions, ISH Stallions, Irish Draught Stallions OR any cross of the aforementioned. © Dams of the fillies must also be by the Stallions as above & registered in the I.H.R. To identify the highly desirable , good looking, saleable horse of Traditional Irish Breeding with potential for a variety of fields and to assist the breeders/trainers and producers to present their 3 Year Old animals to the best advantage for modern competitions and the market place. NO PASSPORT – NO SHOW! To identify the highly desirable , good looking, saleable horse of Traditional Irish Breeding with potential for a variety of fields and to assist the breeders/trainers and producers to present their 4 Year Old animals to the best advantage for modern competitions and the market place. Entry Fee €20 – A photo copy of the traditionally bred FULL PEDIGREE must accompany the entry form and the fee. Passports MUST be available for inspection on show day. NO PASSPORT – NO SHOW! To identify the highly desirable , good looking, saleable horse of Traditional Irish Breeding with potential for a variety of fields and to assist the breeders/trainers and producers to present their 5 Year Old animals to the best advantage for modern competitions and the market place. The aim of this class is to encourage a higher standard of production in the 5 year olds’ and upwards traditionally bred horses, with a view to increasing their market value for the home and export markets. Horses competing in this class should be quality animals, well mannered, athletic, careful and capable of jumping a course of fences to include working hunter /show jumping style (max. height 1.m) . They will be required to display smooth upward and downwards transitions to include leg yielding, lengthening and shortening at canter over fences , landing on correct leads and at all times showing good balance, self carriage and rhythm. Open to Traditionally Bred animals 4 years old and over. Riders must be over 16years of age. Competitors will be required to jump a variety of fences ( Average height 1m approximately). In the event of equal scores – TIME will decide. Prize Fund: 1st €250, 2nd €150, 3rd €80, 4th €60, 5th €40 . *Please note: T.I.H.A. reserve the right to alter the above prize money/cancel classes if deemed necessary in the event of the committee being unsuccessful in securing sponsorship. The Kildare branch of the IDHBA is running a performance hunter show on the 20th of May 2018 at Lullymore equestrian centre. This would be an ideal warmup show for anyone considering doing the RDS qualifiers. The course will consist of a mixture of show jumps and cross country fences. the classes will be run over two heights. Class 1 will be 90 cm and will be on in the morning and class 2 will be 105cm which will be on after lunch. Entries will be taken on the day with a €10 surcharge so it is advised to pre-enter. The Traditional Irish Horse Association are seeking expressions of interest from the owners of traditional Irish mares who are willing to breed these mares traditionally in 2018. • 1.40m plus show jumping or have progeny who has done so. • 3* level eventing or have progeny who has done so. We also ask the owners of well-bred Traditional Irish Colts (one to three years of age) with Stallion potential to contact us with their details. These Colts should be from strong performance families. 18th March 2018 -The Traditional Irish Horse Association (TIHA) has launched their new website for the Traditional Irish Horse. The website new design is a more comprehensive guide to educating new and existing enthusiasts, breeders and prospective customers on the sporting merits and iconic qualities of the Traditional Irish Horse. Features of the website include a refreshed logo, a concise definition of the TIH and an outline of its many uses so that anybody who visits the site will understand what a TIH is and what a TIH can do. It also includes a chronological historical overview of the 2000 year history of the Traditional Irish Horse along with important links for breeders and producers. Crucially it highlights the compelling rationale for Ireland as a breeding nation to conserve and improve the remaining performance TIH bloodlines as part of its sport horse breeding plans. Hugh Leonard (TIHA) adds “ We have included a section for sellers and buyers of the Traditional Irish Horse linking in with the Irish Horse Gateway as part of our marketing platform. In promoting the TIH we want to ensure that anybody who comes to the site can source one and it's our job to support our breeder's, producers and sellers by making their product visible and accessible”.